A beautiful bay filly by Burwaaz out of El Molino Blanco. Burwaaz was a very fast sprinter, placed in group company several times. Lady Lavinia has developed into a strong sort and has a lovely nature. She has three socks, on exactly the same three legs as her sire, Burwaaz. She was foaled on Valentine's Day and has lovely markings with a teardrop shaped star. A good-looking filly, she often claims the best turned out prize when she races! 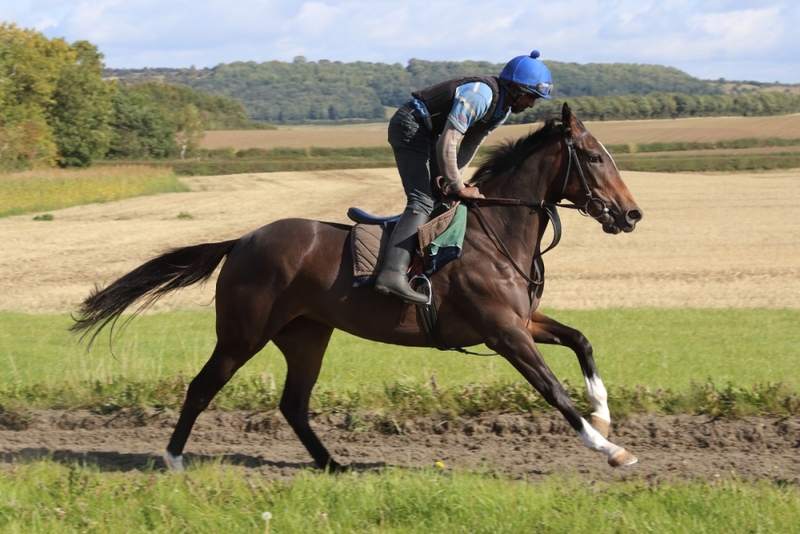 Lady Lavinia was our first two year old winner of the 2018 season when she romped home in a selling race at Redcar. At home she had sparkled and we couldn't figure out why she wasn't winning, until we stepped her up in trip. Her win made her the first winner for her dam El Molino Blanco and also the first ever winner for her sire Burwaaz. Lady Lavinia will make up into a very nice three year old with another winter under her belt. HEAD: Tear drop shaped star conjoined interrupted stripe left of nostril. Flesh mark left side of lower lip. RIGHT FRONT: White to above fetlock, white hoof. LEFT FRONT: White to above fetlock, white hoof. RIGHT HIND: White to above fetlock, higher on inside, white hoof.